You’d agree with me that an air compressor can supply a single source of power for a variety of tools. But, without the best air compressor, your automotive air tools would otherwise be useless no matter how top notch they are. This is because air compressors are the real horsepower. You may have the best automotive air tools, such as impact wrenches, air ratchet, paint guns and still end up with a lame duck if you don’t have an appropriate air compressor. That is why we recommend that you take out time to know which brand is the best for the money. And if you don’t have that time to research the benchmarks, then we’ve got you covered. But, the truth is that choosing a single product is a pretty hard task to do, especially when there are a lot of options to choose from in the market. 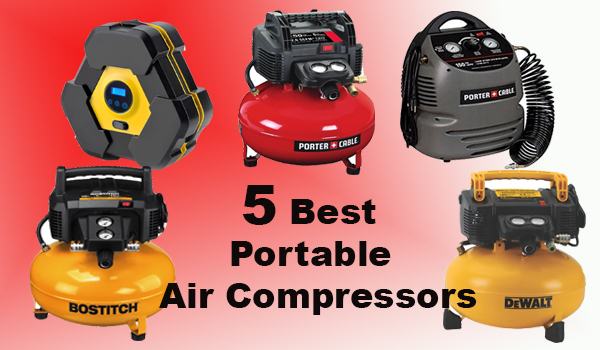 So, we had to sift through a lot of air compressors on the market and dig out the 5 best air compressors for air tools in 2018. 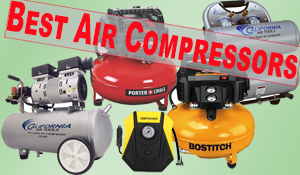 Without wasting more time, here are our recommended air compressors with up-to-date pricing on each. What are you going to be Using the Unit for? The Bostitch BTFP3KIT 3-Tool turns your mild-mannered automotive air tools into an air tank beast for storing pressurized air. The Bostitch earns the top position on our list by serving up a high flow regulator as well as couplers to optimize the performance of air tools. The Bostitch BTFP3KIT 3-Tool is now the go-to air compressor if you’re looking for a brand that delivers 2.6 SCFM @90PSI for Inflating flat tires, sports gears, and home renovation projects, which translates to longer tool run time and quicker recovery. The best part is that it is sufficiently available in a 1-, 2- or 3-tool combo kit for versatile use. Place the Bostitch BTFP3KIT 3-Tool alongside similarly priced air compressors, and there’s no contest at all. Apart from using it for garage air tools, the Combo Kit is perfect for exterior and interior finishing for a variety of crafts like cabinets, furniture, and staircases. In addition to commendable performance, I am also a fan of the flat and round 150 max PSI 6.0-gallon tank (22.7 L), which packs plenty of power to air up to 110 psi trailer tires without any problem. Indeed, the Bostitch we reviewed includes a maintenance-free and long-life oil-free pump for convenient use. This compressor is a cinch to set up, and it is straightforward to use – all thanks to its reliable motor, which delivers an optimal performance even in cold winter conditions. That’s all good, but it was its ability to drive ⅜” crown staples from ¼ inches to 9/16 inches, using its heavy-duty 3/8″ crown stapler that clinched the deal. Similarly, the Bostitch BTFP3KIT heavy- duty ⅜ crown stapler can also drive 18GA brad nails from 1/2″ to 5/8″. Well, that’s not all: its combo also includes 1/4″ x 15′ PVC air hose with fittings and T50 staples. Also, you will get 1-1/4″ 18GA brad nails alongside 2″ 16GA straight finish nails as well as a framing nailer for specific applications. The air compressor also rooms a lot of goodies like an air gun, tire inflator, and other changeable fittings. However, before you run out and buy the Bostitch BTFP3KIT, there are a few things I think you should know about. Chief among them is that the pressure regulator is not as accurate as we wished. Meaning, the air pressure fluctuates a bit when put into heavy use. But, I think Bostitch goes a long way to overcome this deficit by featuring an air regulator to help you stabilize the air pressure. Its powerful air pressure is incredibly quiet at only 78.5 DBA and delivers an operating noise level as well as a quiet work environment. This is one of the best air compressors we’ve ever reviewed, which does not require you to shout out loud to be heard when it is working. The Bostitch BTFP3KIT has a lot going for it, and not just because it produces much pressure. There are so much you are going to benefit using this air compressor. This is one of the best machines that is equally good with any automotive air tools. If it fits your budget, then the Bostitch BTFP3KIT is the number one air compressor to get. If you think the Bostitch BTFP3KIT is quiet, then wait till you see the California Air tools. While the Bostitch keeps boasting of its 78.5 DBA sound, the California air tool came on board to give it a knockout by delivering only 60 decibels of sound. That means its powerful 1.0 HP motor operates only at 1680 RPM creating less wear and less noise. Yes, you’ll be able to listen to cool music while working and carry on a conversation without raising your voice. Still yet, the Bostitch decided to flaunt its 6.0-gallon tank capacity to the world, but the California Air Tools 5510SE Ultra chose to take another route to beat the competition. California came out smart and bought the heart of many by integrating a full-fledged 5.5 Gallon Aluminum Air Tank, making it very lightweight only at 37.5 lbs. The California Air Tools 5510SE Ultra competes with the Bostitch BTFP3KIT by delivering 3.10 CFM @ 40 PSI and 2.20 CFM @ 90 PSI with 120 PSI Maximum Pressure. That said, the 5510SE Ultra wields a modest Oil-Free Dual Piston Pump, but it spins it up by ensuring it gives you high performance and durability. As a result, one can only say that the California Air Tools 5510SE Ultra readily competes with the Bostitch BTFP3KIT in all aspects to deliver the best performance for the money. Even as an Ultra-quiet Air Compressor, the 5510SE Ultra behaved well, by maintaining and delivering longer continuous run times and increase in duty cycle. Just like the Bostitch BTFP3KIT, the 5510SE Ultra decided to appease its fans by making sure its Air Compressor can be used in uneven terrain and a variety of temperatures where other air compressors can't be used. We’ve tested a large number of air compressors over the years, but this brand is a game changer. This air compressor has solved a problem that no one else is tackling. I have always accepted that air compressors were crazily loud. But I was sold on how quiet this brand is. And I can boldly say it’s that good for the price. So, if you’re a hobbyist who runs staplers, and nail guns and also needs a compressor to air up tires, then the 5510SE Ultra is a perfect choice. 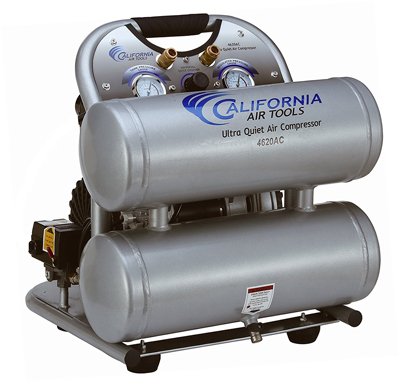 If a company like California Air wants to win over hearts and minds with this premium price air compressor, then this product needs to be better than its previous lineups of air compressors. So, can the competitive, top dollar price earn our recommendation? Let's start with its specs and dig in from there. No doubt, the California Air Tools CAT-4620AC came with some unique perks and features. Unlike the 5510SE Ultra, the CAT-4620AC offers a large 4.6 Gallon Aluminum Air Tank with a Modest Dual Piston Pump. Indeed, the CAT-4620AC lives up to the company's reputation with its remarkable Easy Start Valve feature that produces a no-load condition when it releases air from the pump to start-up. With this in place, the motor will spin freely even in cold temperature with less amps for fluid startup. That said, the CAT-4620AC brings roughly the same sweet spots as the 5510SE Ultra by retaining the same essential features. You still get the same low maintenance cost at only 30% less noise at 70 decibels. It still delivers an Oil-Free Pump System and a powerful 2.0 HP motor that operates at 1680. However, there's a little twist when it comes to the weight of this model and that of the 5510SE Ultra. While 5510SE pride itself for housing a 37lbs air compressor, the CAT-4620AC decided to be different by featuring a 67.2 pound machine. But guess what: the air compressor is still as light as a feather and gives you the needed flexibility to move around your working area. So, should you buy this upgraded version of the California Air Tools CAT-4620AC? First, the reason why California Air compressor 4620AC made it to our list is that it was able to retain a quiet operation even as an upgraded model. Its high 5.30 CFM @ 90 PSI and 6.40 CFM @ 40 PSI and fast recovery of the dual cylinders makes it a force to reckon with. 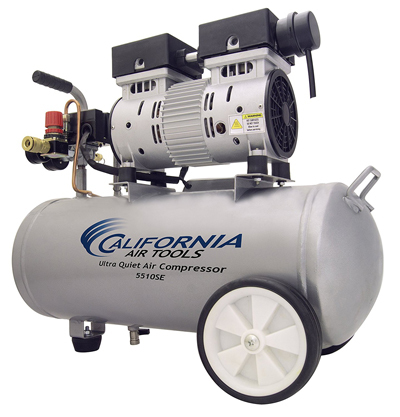 If you are looking for a powerful and reliable air compressor, then the California Air compressor 4620AC is a perfect fit. We'd have high praise for this air compressor even if it were double the price. It's easily one of the best affordable air compressors you can find around. As the model suggests, this is a Pancake style tank unit with optimal stability, water drain valve, rubber feet and a 150 PSI. Getting acquainted with the PORTER-CABLE was a painless process as it wields a higher pressure longer air tool and also features a 2.6 SCFM @ 90 PSI, paving the way for a quick recovery time. Included is an oil-free pump with no maintenance, as well as a low AMP 120V motor for easy starting even in cold weather. 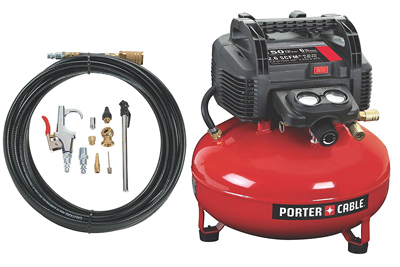 Unlike other air compressors on this list, the PORTER-CABLE C2002 offers a 6-gallon capacity, which is fit enough to run @ 3.5 SCFM. With that said, we have more to be optimistic about this air compressor as it works perfectly in filling tires or firing a nailer. You can even use it to run off a standard household circuit. That said, the replaceable brushes that extend the motor life and 150 PSI max pressure for extended runtime are dominant, without question. With a 13-Piece Accessory Kit and a 25-foot nylon hose, tire chuck, tire gauge, and blow gun, we were blown away to see all the attachments that came along with this machine to give you the best experience. The 25-foot nylon-reinforced air hose is a marvel. It is beautiful, functional and well-made. Not to forget that it houses a 120 PSI cut-in pressure that delivers 30 PSI "Bonus Air" as well as High-Flo air regulator to shield against a massive pressure drop. To replenish the air after it runs out, just attach the hose to an AC power outlet and blow into it until it’s full. Great, right? But here is the downside: with 100dB, this machine is louder than the noise of a television, which is one of the main reasons it is number 4 on our list. The PORTER-CABLE would be a great air compressor for less the price it came. While it is efficient and displayed a fluid working performance, the level of noise it produces and other of its downsides leave more room for improvement. The cheap accessories of the unit coupled with its massive weight are out-shined by competing models. Although it has gathered a lot of great reviews in the market due to its awesome performance, I just feel there are simply better options on this list at its current price point. The fundamental reason we added this product on our list is that it does two main things, and it does them pretty well. First, it inflates vehicle tires and other inflatable objects you can think of. Secondly, it gives you the right information on whether you have the correct tire pressure or not. The best part is that the machine offers a quick and effortless operation, which gives a big relief against getting a flat tire. We were overly impressed by its durable design and how accurate the tire pressure gauge was. With a Maximum Pressure at 150 psi and Working Pressure of 0-42 psi, the DBPOWER 150PSI 12V DC can only carry on a continuous Working Time of 10 minutes. My little gripe about this unit is that you have to let it cool down for like 15mins when it reaches its maximum working time. This alone hampers flexibility and doesn't portray the quality of a horsepower air compressor. But, the fact that the DBPOWER 150PSI 12V DC goes up in a flashing speed to inflate a standard midsize car tire, starting from 0-35 psi in only 3 minutes gives us a course to rejoice and overlook the above deficit. Yes, I earlier said it could only deliver continuous Working Time of 10mins, but even at that, this machine is still active and durable compared to others in this price range. But keep this in mind that you won't be able to pump up 4 flat tires within the 10 minutes maximum working time. However, if you just need to top off your tires, then I think this will be something ideal for you. Regularly inspecting your tire pressure is crucial and necessary for safe driving, fuel-efficiency or tire wear. And a perfect tool that will give you the best result is the DBPOWER 150PSI 12V DC. On a practical budget, it's critical to find air compressors with the best ratio of price to performance. That's why we've previously looked at air compressors in the $20-$200 range. For raw performance and versatility, Bostitch BTFP3KIT seems to be is a killer air machine. It’s quiet, efficient, offers you a lot of attachments and more importantly, its heavy-duty tank can run every automotive air tool you throw at it. You can argue about price and whether or not you really need the 3-Tool and Compressor Combo Kit, but right now, the Bostitch BTFP3KIT is our best air compressors for automotive tools. While the Bostitch BTFP3KIT is the air compressor we'd recommend to most, it's not the only option worth considering. 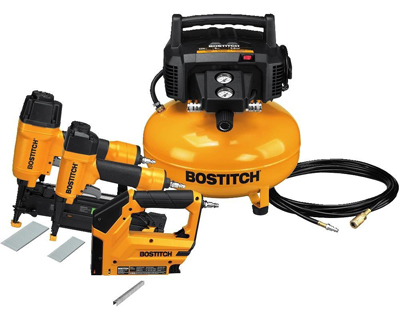 Performance scales, the California Air Tools 5510SE and CAT-4620AC are a similar story that can give the Bostitch BTFP3KIT a fight to remember. 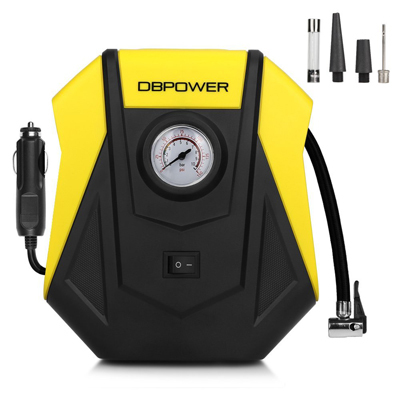 But if you need a lightweight and flexible air compressor specifically for inflating car tires and checking on the tire pressure, then the DBPOWER 150PSI 12V DC Portable Compact Tire Inflator, should be your go-to air compressor. Our air compressors recommendations are based on our exhaustive and extensive benchmarks and testing. We also looked at the reviews and testing done elsewhere. From our fruitful research and findings, we were able to nominate the above units as the 5 best air compressors for automotive tools. An air compressor consists of three major parts: the motor, the pump, and the tank. Most portable air compressors are single staged. In this case, the intake air is compressed once, and then stored in the tank, and they are usually about 90 Psi. The larger compressor can be two-staged. The intake air is compressed twice by two different size pistons, and then stored in the tank. This type of compressors produces a larger volume of air at higher pressures of 351 PSI. 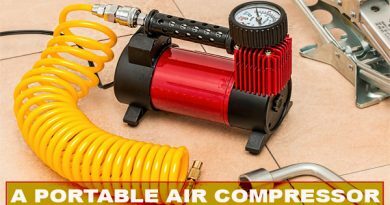 Nowadays, there are tons of air compressors in the market, and this actually begs the question: what should you be looking for when you want to buy an air compressor? Here are a few handy tips that will help you find the one that perfectly fits what you are looking for. When shopping for a compressor, there are two specs you want to focus on: the first one is the PSI (Pounds per Square Inch), which is the measurement of the force of air coming out of the compressor. The other one is the CFM (Cubic Feet per Minute), which is the volume of air coming out the machine. The higher the CFM, the efficient your compressor is, and the better your air tools will operate. So, get as much CFM as much as possible when you are shopping for a compressor. Although you need to be careful not to miss CFM with SCFM as they are quite different. If you already have air tools such as a nailer, drillers, impact wrenches, make sure you look for a compressor with an SCFM is that matches the rating of your tools. You also want to check that the coupler on the air compressors is at the right size. The second thing you want to consider is what you're going to use the compressor for. Are you going to be using it in your home garage just to fill tires on your house? Or are you going to be using it for air tools? This is important because some of the tools can consume a lot of air. And the more air they consume the larger tank you are going to need. An air compressor with a 2-4 gallon tank and an SCFM rating of 0.6-3 SCFM, @90PSI will be sufficient for Inflating flat tires, sports gears, and occasional home renovation projects. But for more continuous construction work or auto repair, the tools require a tank that holds 4-15 gallons with an SCFM rating of 3.5 to 5 @ 150 psi. If you are working in a garage or a workshop and you are planning to do a lot of sanding and grinding or using air sprayer, then step things up to a 20-80 gallon tank with an SCFM rating of 6.5 or higher. Some compressors have wheels on them, and they are very portable. If you have got jobs in front of the garage and or you want to do jobs outside the house to help out your neighbors, you might want to look out for a compressor with wheels on them and a smaller unit with a handle. You need to find out the noise level of your compressor before you anger your neighbor. Anything starting from 90 decibels is pretty loud and noisy, especially if you plan to work with it through the night. Looking forward, the air compressor world is a fast-changing field. There are a lot of new models launched on a yearly basis, and keeping track of it all can confuse even the best of us. Our different recommendations are based on performance combined with current prices. If you are looking for the most reliable model to buy, then look at the above-recommended products and choose the one that best fits your budget. Those who already own the BOSTITCH BTFP3KIT 3-Tool and Compressor Combo Kit or California Air Tools 5510SE Ultra should be able to run any automotive air tools conveniently with less noise and low maintenance. These air compressors happen to be the best in the market for the money. 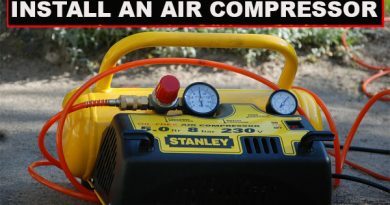 Have you used an air compressor before? What are your experiences? Let us know in the comments.